QUESTION: How does one locate these in the USA: banaba and bitter melon? Our local stores do not carry them. With regards to banaba (or Lagerstroemia Speciosa, the other scientific name), although it is mainly growing in South-east Asia, to my knowledge, it is also growing in some locations of California and Florida in our days. If you do not currently live in those parts, you can ask in any store or drug-store for its dried leaves. The same stays for bitter melon (or bitter gourd). You may easily find them at any herbal store (including those from Asia). Or you may find their extract in the form of capsules or pills at any drug-store (see the supplemental corner). If you want to have the fresh herbs, you can contact your local herbal store. Now, there is always a natural remedy for each condition in every part of the world. What I mean is that if Asians can lower their blood sugar easily by using their herbs; you can do it the same with the herbs commonly found in USA. I came across an article, where there were reviewed the use of many herbs commonly found in USA from Hispanic population to treat diabetes. 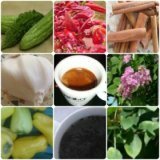 Some common herbs for diabetes commonly found in United States mentioned there were: Diabetil Tea, Bricklebush, Aloe vera, Prickly pear cactus, Wild grapes, etc. So, do not necessarily go for Asian solutions where you can find your own solution not so far, withing the USA territories. Comments for Where to Find Banaba & Bitter Melon in USA? I use both banaba and bitter melon (along with others) from Swanson Vitamins. Price is right and they work for me.